It is beneficial for maintaining a healthy cardiovascularand nervous system; and supporting strong healthy bones and joints. It is enriched with Vitamin E; cold pressed and hermetically sealed in a soft vegetarian capsule to maintain freshness and purity. - Play an important role in nourishing the hair, skin, teeth and gums. 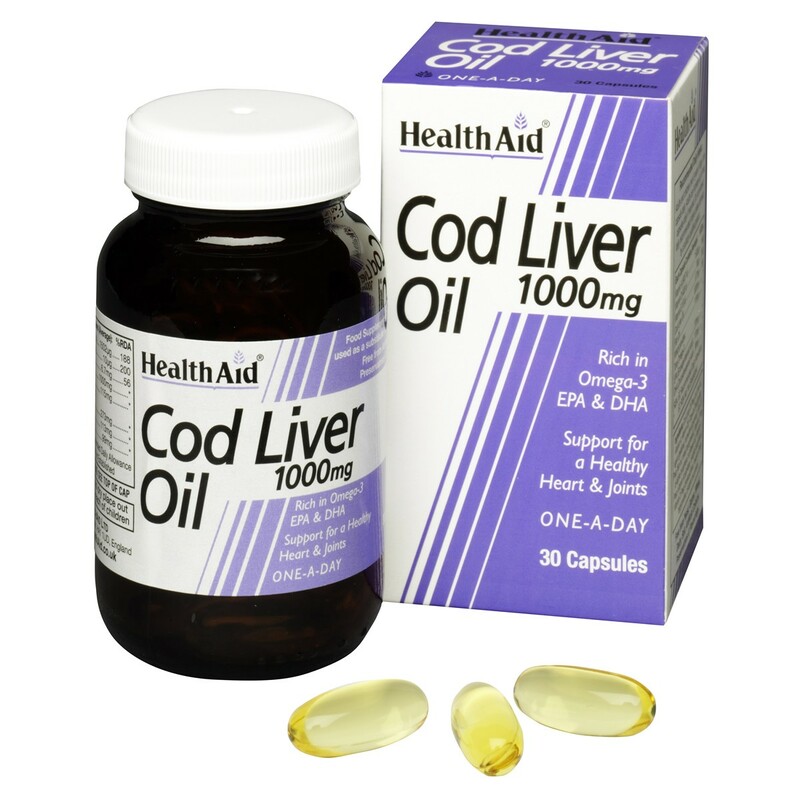 Cod Liver Oil, Capsule Shell (modified starch, glycerine, carrageenan, disodium phosphate), Vitamin E prep (d-alpha tocopherol*, sunflower oil), Vitamin A prep (vitamin A palmitate, sunflower oil, d-alpha tocopherol), Vitamin D prep (cholecalciferol, d-alpha tocopherol), Medium Chain Triglycerides (coconut and palm kernel oil), Lecithin*. *from soyabeans. Adults and children over 6 years of age, one capsule daily.Adults can increase up to two capsules daily if required.Do not exceed recommended daily intake unless advised by a suitably qualified person. This product contains Vitamin A.Do not use if pregnant or likely to become pregnant except on advice from a doctor or ante-natal clinic.Allergy Information: This product contains fish oil and soya. 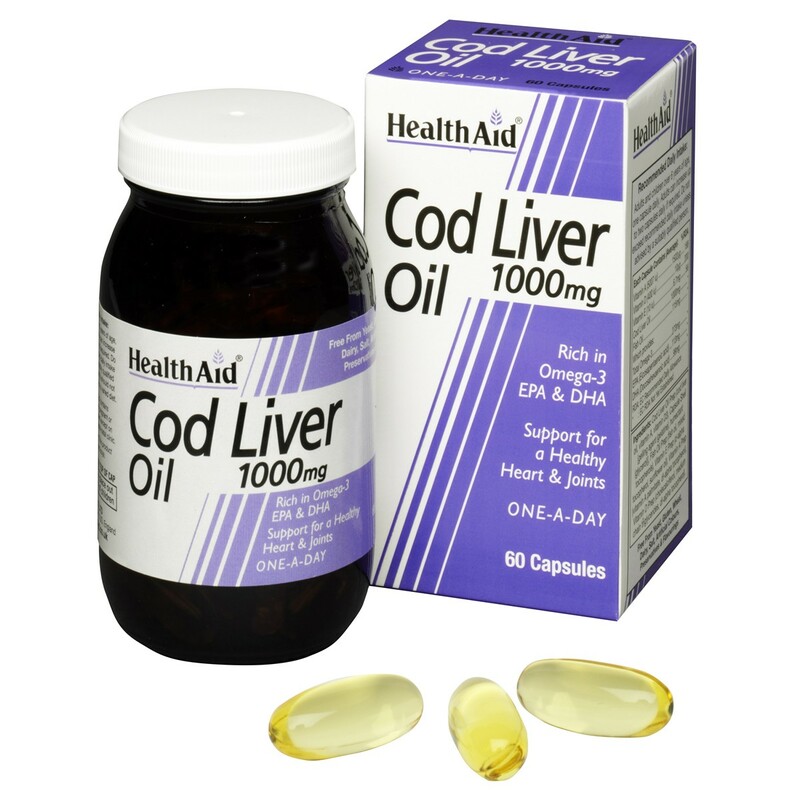 Thank you for your interest in HealthAid Cod Liver Oil 1000mg Vegicaps. Enter your email and we'll contact you as soon as it's available again.